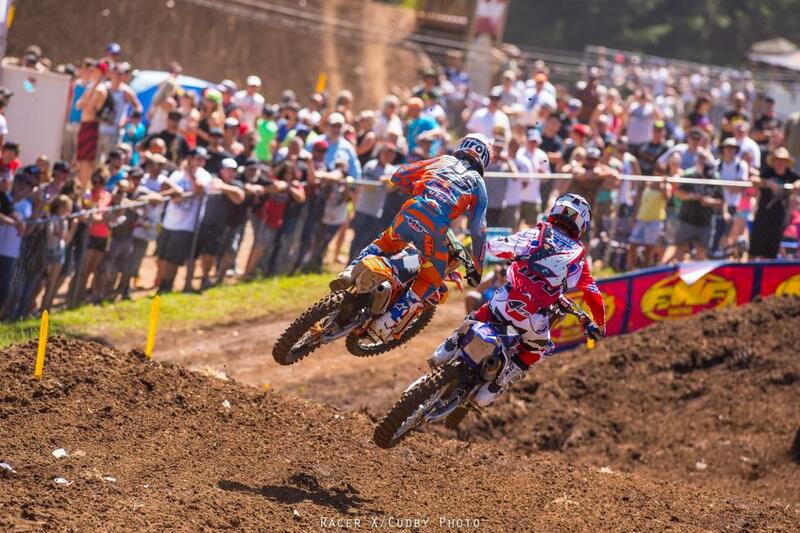 Dungey was the man in Washougal. 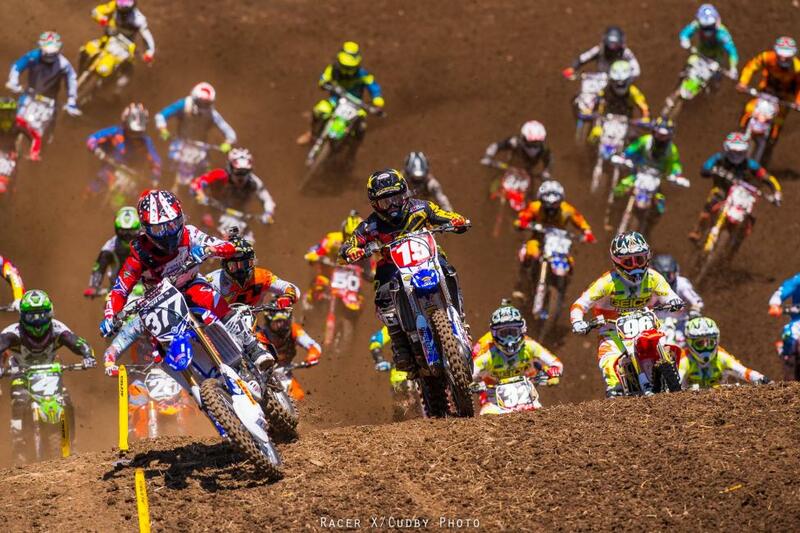 The gate dropped on the ninth round of the 2014 Lucas Oil Pro Motocross Championship in Washougal on Saturday, and while not many expected anything of significance to change in the 250 Class, the potential was there for a notable points swing in the 450 ranks. And when the day was over, that potential had been realized with Red Bull KTM’s Ryan Dungey taking ten points out of teammate Ken Roczen’s lead. “Personally, I felt like Millville was the track where I was supposed to make a dent, and it didn’t happen,” said Ryan Dungey after the race. He had hoped his home-state track would give him 1-1 scores and max points, but maybe it’s not surprising he did it at Washougal, where he’s won four out of the last five years in the 450 class. While Dungey doesn’t feel like the Washougal track lends itself to him in any certain way, he’s certainly aware of all the success he’s had there—including his first-ever 250 class overall victory back in 2008—and felt some good vibes in the morning. This was by far his best National performance all year, winning both motos, leading every single lap of the day and locking down the Oakley Bomb Award for the fastest qualifying lap. Roczen still has a 14-point lead, but the momentum has unquestionably shifted in Dungey's favor. My how the tide has changed. 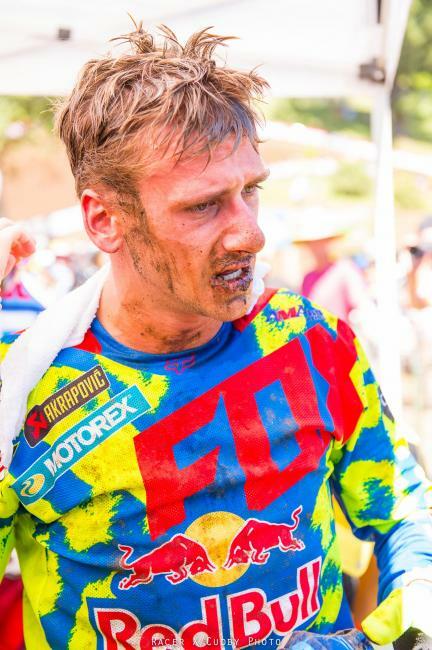 Ken Roczen finished third via 3-3 scores but looked down in the post-race press conference. “I got a 3-3 and I got to take that but obviously right now I’m not riding how I did on the beginning of the year. There are some sacrifices I have to make. I just play golf and jump in the pool and all of that. I’m willing to do anything to keep that red plate.” Roczen, looking for a new edge, flew his trainer Aldon Baker in for the race and will have him at his side at the remaining three rounds (Baker’s deal to come to races was only through Ryan Villopoto, so he hasn’t gone to many Nationals this summer). Had Tomac not finished ahead of Roczen, Roczen would have only give up six points instead of ten. With six 450 motos left in the season, a 20-point lead sure sounds nicer than Roczen’s actual 14-point lead. 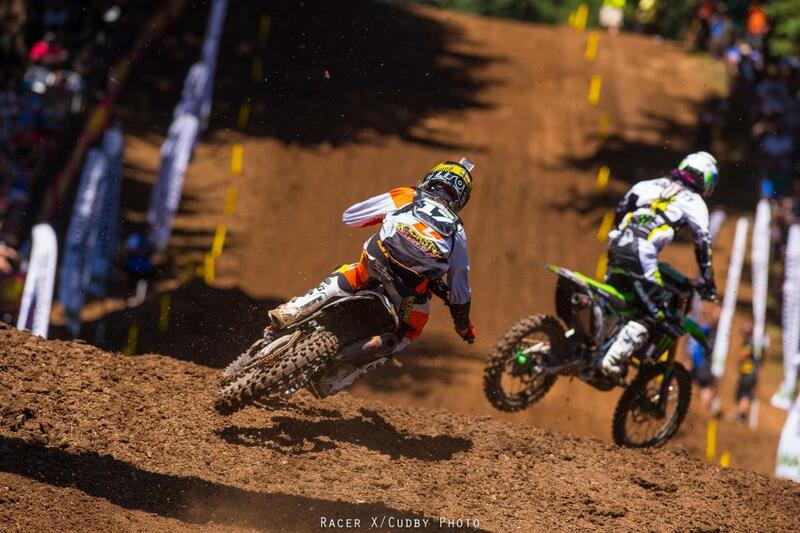 Justin Brayton and his JGR machine were holeshot artists in Washougal. 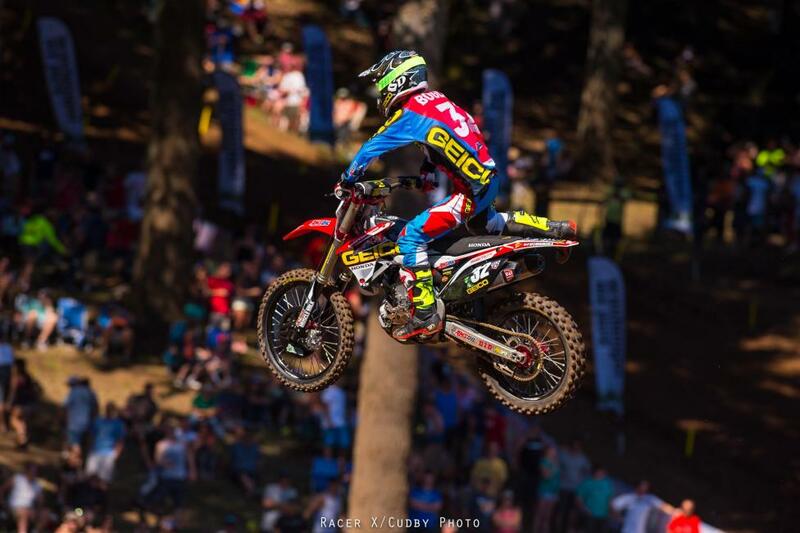 Team Honda Muscle Milk’s Trey Canard didn’t have the greatest of days. He took fourth in the first moto but crashed in the second and had to wait for the pack to go by before he could get back on his bike and get going again. He managed to salvage an eleventh, which gave him seventh overall. Not Trey’s best result but hey, at least he’s not leaving Washougal with another broken femur! Fredrik Noren just keeps continuing to take full advantage of the tremendous opportunity he’s been given as a fill-in rider at Team Honda Muscle Milk. He went 9-7 today for eighth overall, a career best for the Swede. Speaking of people who keep taking advantage of their opportunities, how about Brett Metcalfe and Andrew Short? Both had great days, with Metcalfe taking fourth overall and Short fifth overall. Short and Metcalfe—walking quietly but carrying big sticks. Eli Tomac was faster than Roczen in Washougal, but not as fast as Ryan Dungey, who was faster than both Tomac and Roczen. Got it? Good. Chad Reed showed some great speed today but had to pull out of the second moto when his lower back started hurting. And did we mention he’s got a baby due any day? Now you know. Tevin Tapia probably isn’t going to be bragging to everyone about his 18-20 for twentieth overall today, but if you know the whole story you’d probably be impressed. He forgot his mandatory helmet eject system, and when an AMA official noticed it the gate was about to drop. Tapia sat on the line while his dad sprinted back to the pits to get another helmet while Tapia sat on the line and watched the pack blast away. Twenty seconds later he was roosting after them, and when the checkers flew he’d managed to claw back up to twentieth, the final points-paying position. Nice job! Marvin Musquin and Christophe Pourcel, who weren't selected to be on France's MXoN team, went 1-2 in the first moto. Couple of hero rides from a couple of Tommys. Comeback artist Tommy Hahn was in action today, going 15-10 for twelfth overall and the other Tommy, local legend and hero Tommy Weeck, also had a fantastic day, going 16-9 for eleventh overall. You may have noticed that Josh Grant wasn’t racing today, and that was because of a big crash during qualifying. It appeared as though he got cross-rutted while going up the jump that’s at the base of Horsepower Hill, and he got thrown from his bike and slammed hard into the dirt. His bike was still bouncing and smacked into him, and teammate Justin Brayton nearly smashed into him. Later we went by the JGR pits and his mechanic was prepping his bike because he wasn’t sure whether or not Grant could race. Turns out he couldn’t answer the bell, but here’s hoping he’ll be back for Unadilla. You may have also noticed that Anthony Rodriguez didn’t race either, and that’s because he crashed in the same exact spot as Josh Grant. A quick check with the team afterward revealed that he’d hit his head pretty good and would miss the day’s action. Let’s hope he makes it back for Unadilla also. The stage was set for a great battle in the second moto between Blake Baggett and Justin Bogle but Bogle had a little tip over right when things were about to get heavy. 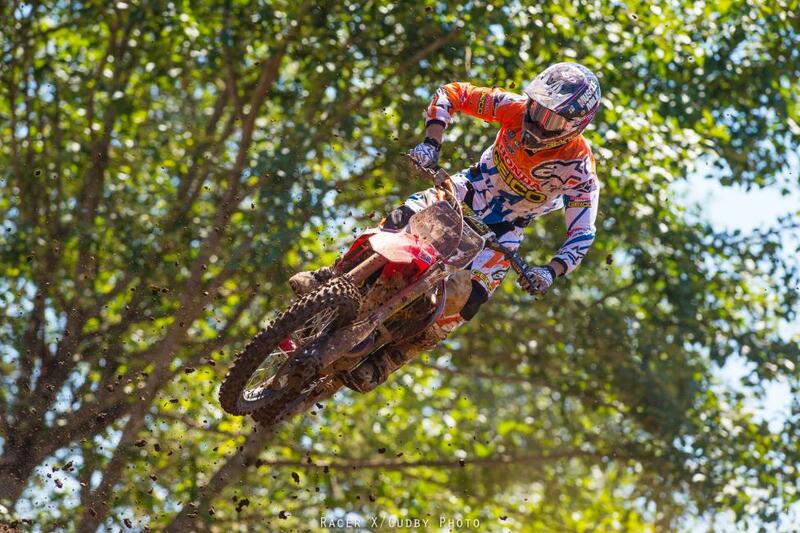 Jarryd McNeil raced at Washougal today. Yes, we’re talking about Jarryd McNeil the freestyle motocross athlete, and yes, he made the main. In fact, he didn’t even have to go to the LCQ to do it! His day didn’t come without some drama though, as a crash in qualifying resulted in a broken radiator. McNeil had a hard time finding a replacement, until he went into the amateur pits and paid someone $150 to borrow a radiator. He ended up going 29-23 for 25th overall in what was his very first attempt at an American National. “Not bad for a freestyler!” McNeil said afterward. Not bad at all! After not being selected for the French MXoN team, Red Bull KTM’s Marvin Musquin went out and had a ridiculously amazing day at Washougal, going 1-1 in what was probably his strongest performance ever on American soil. He wasn’t handed anything either, as he had to pass guys like Blake Baggett, Christophe Pourcel and Justin Bogle to get it done. 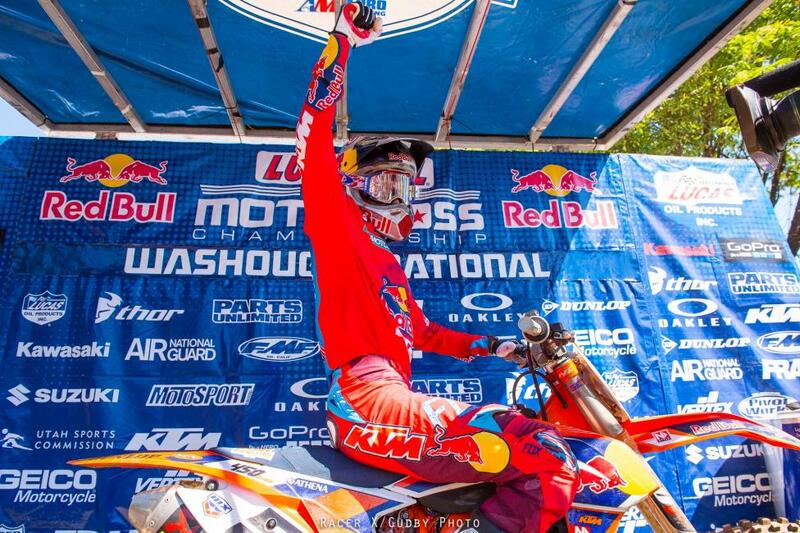 Musqin just had a standout day in every way shape and form in Washougal. While we’re on the subject of Pourcel, we’ve got to mention his up and down day. He had a great first moto, taking second place, but his second moto was positively horrendous. 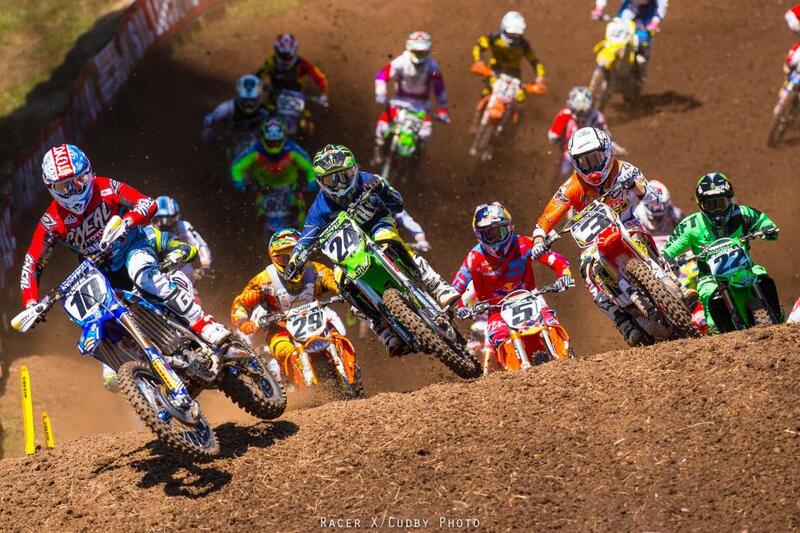 He got the holeshot but simply could not hang with the leaders. In fact, he couldn’t hang with a lot of guys and ended up sliding all the way back to fifteenth. He was even lapped by countryman Marvin Musquin. It wasn’t pretty, and afterward we checked in with team manager Erik Kehoe to see what had happened. Kehoe explained that Pourcel had had a couple of close calls in the moto that spooked him, and after that he just didn’t feel comfortable out there. 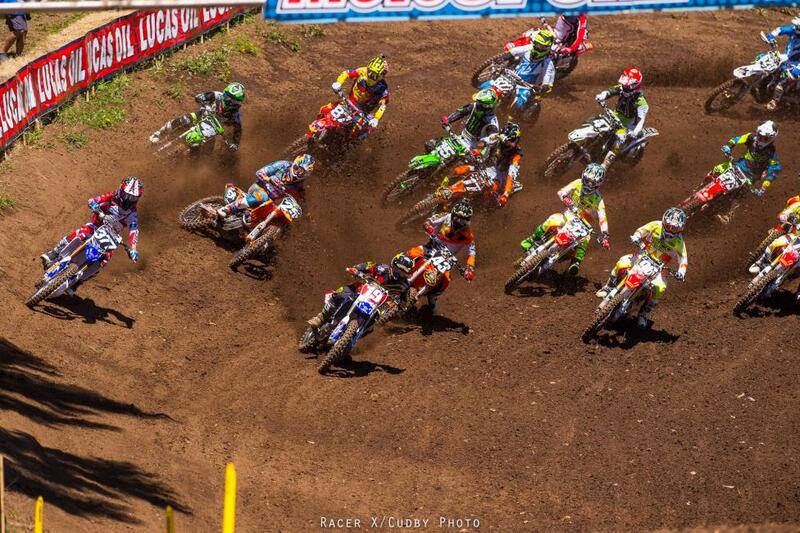 Pourcel holeshot both motos in Washougal, so there's that. Not exactly the day Cooper Webb wanted, but it wasn’t too shabby either. He went 3-5 for fourth overall, but he did it battling a bike that was bogging in the early part of the first moto. Afterward Webb said he thought water had gotten somewhere where it shouldn’t have. Jason Anderson was flying today but you’d never know it by looking at the results. He had a big crash when he high-sided in the first moto that knocked him out of action for the day. Good news is that he should be back for Unadilla. Anderson was on fire in Washougal until a big high-side ended his day. Jeremy Martin didn’t have his best day of the year but finished up solid and on the podium. Martin said he struggled last year here, going 29-12, so he just wanted to get on the podium, and he did exactly that. He wasn’t spectacular, but he got good starts and maximized his performance, and was again aided by bad starts and mistakes by his primary title competitors, Cooper Webb and Blake Baggett.